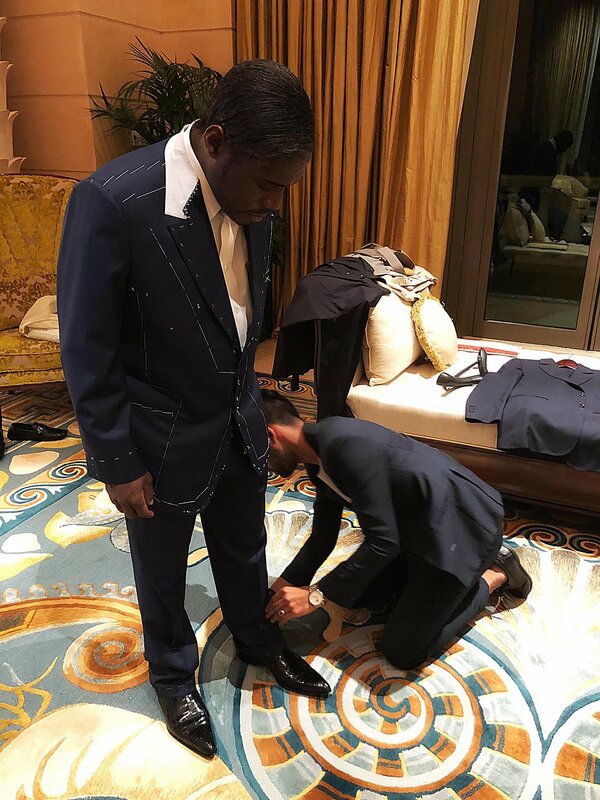 Dressing the Vice President of Equatorial Guinea - Atelier WAEL. It's not everyday that you get to dress up the Vice President of a country, and that is precisely what happened with us. 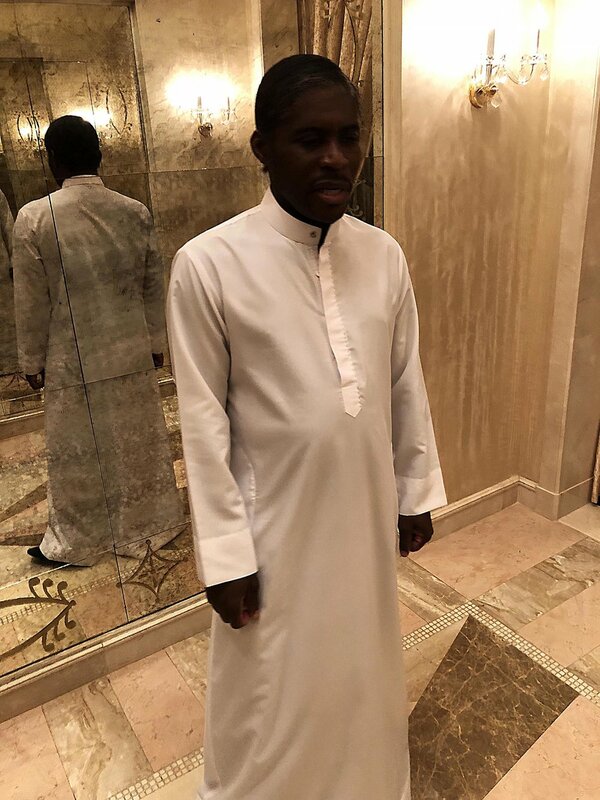 I received a call close to midnight from an associate informing me about an extremely important guest staying at the Atlantis, The Palm that needed to be measured for a suit amongst other things, as a matter of urgency. Completely dumbstruck as I was just about calling it a night, I didn't know how to politely decline so I tried telling him that I had none of my suits on me and I wasn't well dressed. He didn't buy it. Forcing myself into the mood, I put on something to wear and headed out with the motto "when duty calls". In the car, I called him and asked him who it was. It was Teodoro Nguema or more famously known as "Teddy", the Vice President of Equatorial Guinea. Now that's when a sudden jolt of energy passed through and everything became all-the-more exciting with a build up of anxiety. I arrived at the hotel and waited at the bar with the PA of Teddy, waiting for his protocol to give us the clearance. By 12:30am we were up in his mansion-like room, the Royal Bridge Suite. I was ecstatic after our meeting but I knew that we had very little time to turn this around, especially considering he wanted a full canvassed suit based on a sample suit that he gave me, which was fully "loaded" with handwork. Of course my engines started quite early in the morning; my anxiety levels were still high! It almost felt like 'The Matrix' was going on in my head as I felt like teleporting and transporting my way from one task to another. First thing as the clock struck 09:00 and my team started walking in, I got my master tailor to cut the pattern of Teddy's sample suit whilst I arranged for his fabric. I picked a simple Super 150s Merino Wool in navy blue by Reda1865. In the meantime I also picked the fabrics for his traditional safari suits, formal and casual shirts and put them into production. By afternoon, I got a call from his associate asking me if anything was ready and whether I could come by 3pm to which I said - it's impossible. He then asked me to bring whatever I could by 5pm and at that stage, I barely just managed to finish his handmade shirt. Caught in the moment, I took the call of preparing his suit as a second fitting rather than first, as I now had time till the next day (for the suit at least). That evening I also decided to take a t-shirt along from my edition monochrome collection. I was sure he would like it and he did. The bespoke shirt that I made for him was almost a perfect fit too and so we were onto a good start. Given the suit I was making was a full canvassed one, the time usually taken is x3 folds compared to a fully fused suit. As you would recognise from my blog on the "walkthrough of suits from the past", we are known for being the solution to last-minute tailoring. I don't usually like using this card but THIS TIME, it was absolutely essential! Using a readily made chest canvas and shoulder pads to reduce some of the work hours; the rest of the horsehair canvas was sewn onto the fabric. The top wallet and the two flap pockets were made in full as well as the lapel, leaving only the top collar made out of canvas. Inside pockets of the front panels were made full with the lining fixed. The sleeves were basted into the shoulders without the buttonholes made. The rest of the lining was left unfixed. As for the trousers, both legs were created in full including the pockets, leaving the waist belt and all the handwork to be finished later. The result of the fittings came out exactly as I had expected. Not perfect but not too shabby either. Of course we had worked from a given sample and there were bound to be minor alterations in the suit but suffice to say I had exceeded his expectations in terms of my turnaround, which gained his trust. All the other items also fit pretty well with minor alterations. I must admit that we weren't able to send the suit with Teddy on his flight but I did send everything else with him. As much as I would love to, it's quite literally impossible to complete a full canvassed suit in such a given timeframe - even though I put 2 tailors on board. The fact that I made a decision and never looked back won his trust and he did mention he'd have more work coming our way.